Dan Brown rocks the thriller world with “The Lost Symbol”. A rollicking novel that deftly weaves science with religion and fact with fiction. “The Lost Symbol” is clearly the best of the genre written by the master of hidden meaning, symbols, and codes. In “The Lost Symbol”, Robert Langdon has arrived in Washington D.C. at the request of his good friend Peter Solomon (Head of the Smithsonian). Peter is without a keynote speaker (a last minute cancellation) and Peter thought that Robert could fill in with a talk he had given previously on Masonic history and symbolism in Washington D.C. buildings. Arriving at the Capital Building, Robert finds out that he had been duped. A call to his cell phone by Mal’akh confirmed that he summoned Robert believing that Robert is the only person who can find and unlock an ancient portal in Washington D.C. In this portal lie the “Ancient Mysteries” that Mal’akh needs to complete his “transformation”. A blood curdling scream sends Robert running into the Capital Rotunda. In the middle of the rotunda is a hand, a right hand, with the index finger and thumb pointing up. Blood is dripping below the wrist…it is a real hand with a Masonic ring of the highest order on the ring finger. Peter’s hand. Mal’akh has given Robert until midnight to find the clues and unlock the mystery of the ages, or Peter will die. Thus starts the latest Robert Langdon adventure (that began with “Angels & Demons”). Joining Robert in the quest to find the ancient portal and to unlock the secrets held within is Peter’s sister, Katherine. Katherine is a scientist working in a secret lab in the Smithsonian studying Noetics; the study of the power of the human mind. I cannot do the book justice in 500 words or less. But I can tell you that you will be taken on an epic journey though history filled with symbolism and clues hidden in Washington D.C. buildings, paintings, sculptures, pyramids, capstones, rock cubes, works of literature, and Masonic lore. We have waited awhile for “The Lost Symbol” but the wait is well worth it. I highly recommend picking up the hardcover. You will not be disappointed, but, put on your thinking cap as you read and fire up your computer…..’cause you will be searching the Internet to learn more! 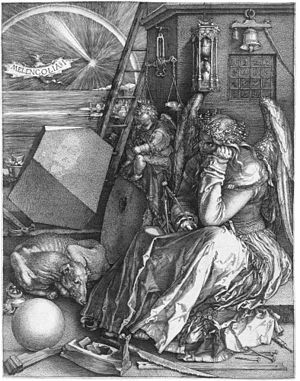 This painting is crucial to helping Robert unravel the clues of the Masonic Pyramid (click on the picture to go to the Wikipedia article). Do you know the meaning of the word: Apocalypse ? Are you afraid that Dec 21, 2012 will be the end of the world? Do you know what a magic sqaure is? Have you heard of Ben Franklin’s 8 x 8 magic square? Can the mind control mass? Can masses of people thinking the same thoughts cause random number generators to become less random? Go here to visit the web page of the Institute of Noetic Science.